The main purpose of the guitar head is to hold the tuning keys and associated parts where the end of the guitar strings attach. 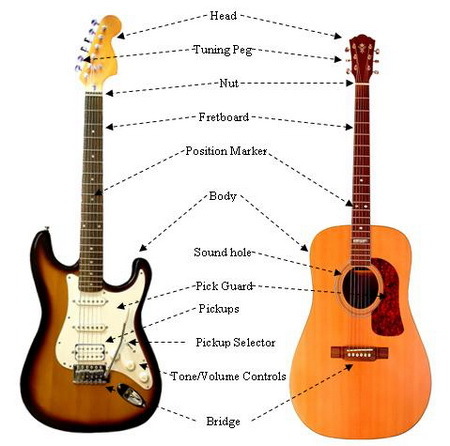 The design of the head can vary depending on the type or model of the guitar. Typically, a classical guitar head is slotted whereas the acoustic and electric are solid. However, the design of the guitar head has no affect on the tone the instrument produces. The function of the tuning pegs is to tune the individual strings to the correct pitch. This is accomplished by turning them clockwise or counter clockwise, which in turn increases or decreases the tension on the string, thereby raising or lowering the string’s pitch. Just below the guitar head where it meets the neck of the guitar is where the nut is located. The nut creates the spacing between each string and maintains their position. If it is a six string guitar, there will be 6 grooves in the nut where the strings pass through. The strings travel through these grooves and on to the tuning pegs. An important feature of the nut is that it affects the “action” of the guitar. If the nut is worn, it could create a buzz when strumming the stings. The fret board runs the length of the neck of the guitar and contains the frets, the metal bars that are perpendicular to the neck. The fretboard is basically where the left hand fingers (on a right-handed guitar) will create the various notes to be played. Depressing the string at each of the frets will produce a different note. Position markers are located on the neck (or fret board) and serve as a way for the guitar player to locate a particular fret more easily. The markers are usually positioned at the 3rd, 5th, 7th, 9th, and 12th fret. Electric guitars and acoustic cutaways have the position markers further up the neck as these types of instruments allow greater playing flexibility at these higher positions. Take note that the 12th fret position marker may be different from the others along the neck. The reason is that at the 12th fret, the string produces the same note as when it is played while open, though it is an octave higher. The sound hole is the opening in the body of the guitar and where the sound resonates from. Both classical and acoustic guitars usually have hollow bodies and, therefore, will have a sound hole. Unlike the acoustic guitar, electric guitars have a solid body. Since a sound hole is not possible, electric guitars use pickups to “pick up” the sound of the vibrating strings. The pickup than transmits the sound to an amplifier. The volume of the guitar can be controlled either by a volume control knob mounted to the body of the guitar or the amplifier itself. The bridge is mounted to the body of the guitar where the strings originate from and supports the strings. The bridge, similar to the nut, affects the “action” of the guitar. Often times, if the bridge height is to high or low, difficulty of play or string buzz can result. 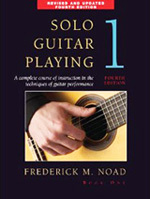 The body is the main section of the guitar and contains the sound hole or pickups, the bridge, and other elements such as volume and tone controls, all depending on the type and model of the guitar. The body can take on many different shapes and sizes and be made of different materials other than wood. Because of this, the body has a great impact on the sound quality of the guitar.